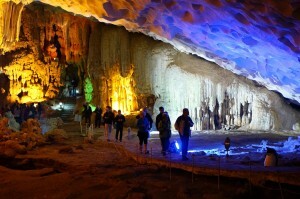 Sung Sot Cave is on the same island with Trinh Nu cave. The path to Sung Sot is quite steep and is lined with shady trees. The cave has 2 chambers. The outer chamber is square and is often referred to as the waiting room. The cave’s ceiling is approximately 30 m high. The walls are almost perfectly smooth as if it was built by man. The walls generate a variety of colors that blend with the setting of the area. The path to the inner chamber is approximately 3m wide. The inner chamber is known as the serene castle. The formations in the chamber take the form of sentries conversing with one another, animals in varying poses etc. In the middle of the chamber stands a formation which resembles a general surveying his troops. There is a side entrance which is approximately 6m in height. The light reflected from the moving water outside causes the formations inside the chamber to seemingly come alive. 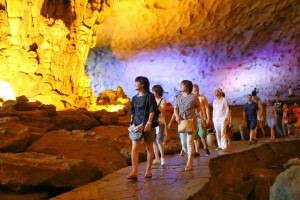 According to the locals, this was the reason the cave was named Sung Sot, from the awe-stricken reaction of the visitors to the cave. Inside, it is partitioned into two chambers; the first one being similar to a wide Theatre Hall. Many stalactites hang from the high ceiling, with numerous possible forms and shapes. A narrow passage leads to the second rooms, where a flow of light meets visitors. The chamber is so immense it could contain thousands of people at one time. 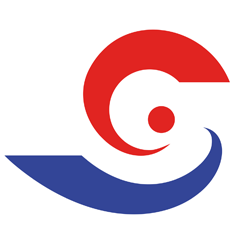 It is situated in the central tourism centre of the bay, as well as Ti Top Beach, Bo Nau Grotto, Me Cung Grotto and Luon Grotto. French named it “grotte des surprises” (grotto of surprise). From the wharf, you climb 50 steep stone stairs to the mouth of the grotto, which lies 25 m above the sea level. Going down some 10 stone stairs, you reach the mouth of a grotto. The grotto covers some 10,000 m2. Inside the grotto there have thousands of stalactites and stalagmites along the 500-meter paved passage. Light posts line the passage and serve as signposts and ornaments. The lighting system with elegant styles adds more charm to the beauty of the grotto. At the side of the entrance, the rock seems to form the shape of a horse with a long sword. Legend has it, that after having defeated the An aggressors, Thanh Giong (the Saint Giong) helped the population to chase away evil spirits and demons. After this feat, Saint Giong flew to heaven, leaving a stone horse and sword to continue to keep the demons away. Sung Sot Cave is typical for karst caves on Halong Bay and has high scientific value in the field of geology.